The number of grey seal pups born on a Norfolk beach this winter has already topped last year's figure. Latest statistics show 1,643 pups have been born on the three-mile stretch of beach and dunes at Horsey. Colonisation there began in 2003, when there were fewer than 100 pups. The total was about 1,500 during the last November-January pupping season. 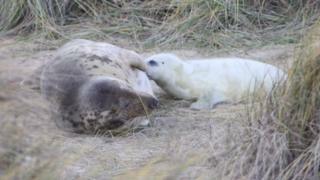 Peter Ansell, of Friends of Horsey Seals, said: "This has been an astonishing success story." The Friends of Horsey Seals volunteer group carries out counts, and patrols the taped-off beach to discourage people walking down from the top of the dunes. Mr Ansell said he expected the seal population to continue growing year-on-year "until a natural disaster", disease or dwindling fish stocks. Further along the Norfolk coast at the much older colony at Blakeney Point, 2,598 pups were counted this week, up from the previous record set in 2014. At Donna Nook Nature Reserve in Lincolnshire, there were 1,984 newborns, compared to 1,957 last year. Reserve managers said the population had started to level off in recent years. Last year, experts said the colony at Horsey was becoming more used to the presence of humans, although the reasons for the more rapid population rise was not known. There are currently concerns about walkers and dogs disturbing the increasing number of seals sheltering in the dunes at the Winterton end of the beach. Mr Ansell, who is chairman of the Friends group, said: "We would suggest dog-walkers avoid that area, as even when pets are on leads, you could just walk into a seal hidden in the marram grass. "Dogs could easily come off worse if there's a confrontation, so it's in owners' interests to stay away if they want to avoid vets' bills." The pupping season is expected to finish in January.